Ageing cats have different nutritional needs than their younger counterparts; that’s why it’s important to modify your cat’s diet as it ages, to ensure that those needs are being met and maintained. 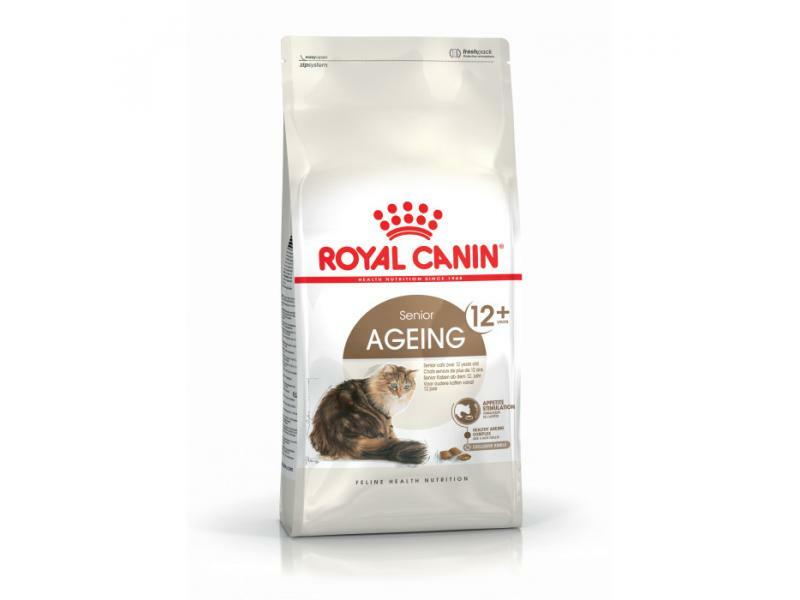 ROYAL CANIN® Senior Ageing 12+ is suitable for cats over 12 years of age and is specially formulated with the nutritional needs of senior cats like yours in mind. This food contains highly palatable kibble with a double texture (crunchy outside, soft inside) that helps to stimulate your senior cat’s general appetite. ROYAL CANIN® Senior Ageing 12+ contains a patented complex of antioxidants that support senior cats throughout the ageing process. Thanks to a moderate phosphorus level, ROYAL CANIN® Senior Ageing 12+ also helps to support healthy kidney function, which is highly beneficial in senior cats. 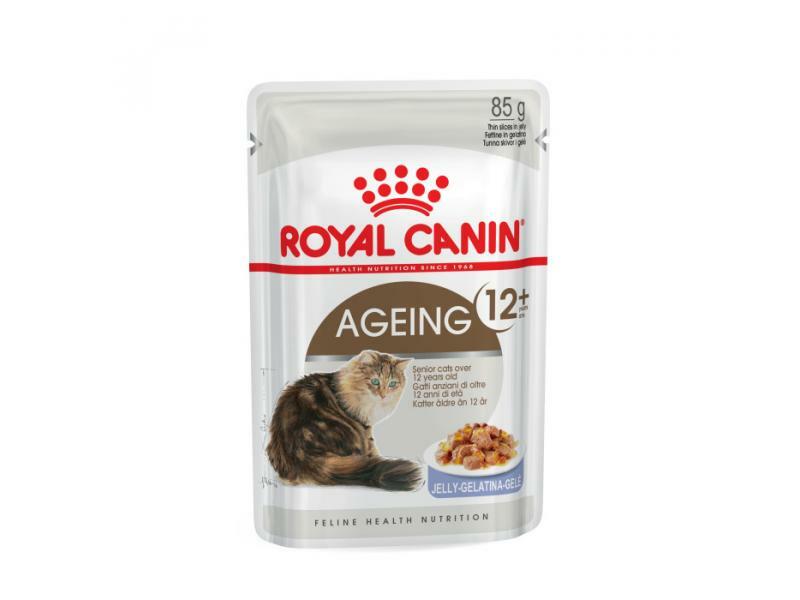 To cater to each cat’s individual preferences, ROYAL CANIN® Senior Ageing 12+ is also available as wet food in either a delicious gravy which is is formulated to match the optimal Macro Nutritional Profile that is instinctively preferred by ageing cats like yours. Senior cats will often need higher levels of nutritional support for the overall maintenance of good joint health. This is why ROYAL CANIN® Ageing 12+ in Gravy is specially formulated to help maintain healthy joints through a high level of Omega-3 fatty acids – specifically EPA and DHA. To help support healthy kidney function and overall renal health, ROYAL CANIN® Ageing 12+ in Gravy also contains an adapted phosphorus content. If you’re considering mixed feeding, simply follow our feeding guidelines to ensure your cat gets an accurate amount of both wet and dry food for optimal benefit. Appetite stimulation - AGEING 12+ helps stimulate the senior cat’s appetite with a highly palatable, double texture kibble which is easy to chew. Below are some recent questions we've received regarding ROYAL CANIN® Feline Health Nutrition Ageing 12 Adult Dry Cat Food, including answers from our team. I cannot find any information about the nutritional content of Royal Canin +12 biscuits. Protein: 30% - Fat content:19% - Crude ash: 5.2% - Crude fibres: 4.7% - Per kg: EPA/DHA: 5 g - Phosphorus: 6 g. *L.I.P. : protein selected for its very high assimilation.